President Donald Trump’s threat to halt aid to Honduras, El Salvador and Guatemala could backfire. The “Honduran caravan” is a political tactic before the midterms; it threatens to divide Trump against the allies he needs to resolve illegal immigration from Central America. The caravan is a distraction that diverts Trump from the real problem: the deep-state and holdover-infested State Department. Rogue officials have supported violent socialists and promoted lawlessness in Guatemala, the key gateway to the United States. The consequence is an open pipeline for illegal migrants, organized crime and narcotics. To reach the United States, the 4,000 migrants must pass through Guatemala’s 595-mile border with Mexico. There are countless unofficial crossings — in many places, one scarcely knows which country he is in—and illegal migrants traverse Guatemala without fanfare. 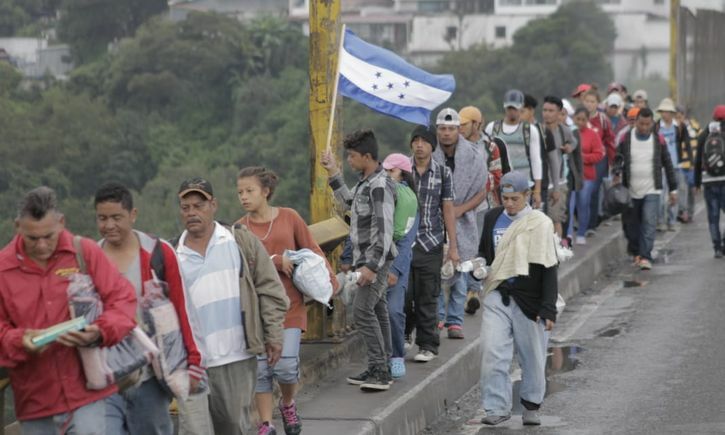 The fact that caravan migrants are traveling openly and apparently will utilize official crossings confirms this is a political stunt, which could favor Democrats in the upcoming elections. Mexico’s inability to impede criminal cartels and the lack of security in border areas make Guatemala the unlocked back door to the United States. The lawlessness is attributable to the State Department’s imposition of socialists — anti-American totalitarians — on Guatemalan governments. The Obama administration ignored corruption under former president Otto Pérez, so long as he served their purposes. U.S. officials looked the other way while he retained their socialist allies in key positions, especially in security and justice. Barack Obama appointed his henchman ambassador in the second half of Pérez’s tenure. Now the State Department’s senior advisor for Central America, Todd Robinson became the man pulling the nation’s strings, with the Guatemalan president subject to his dictates. Robinson used U.S. power to install criminal magistrates to Guatemala’s highest court, the Constitutional Court. Working in concert with Robinson and the coopted court, the U.N. Anti-Impunity Commission (CICIG) has catalyzed the globalist, socialist takeover of Guatemala. The CICIG supposedly helps the Justice Ministry identify and dismantle clandestine security apparatuses that deprive inhabitants of human rights. Instead, the CICIG has used diplomatic immunity to take over criminal prosecution and become what it was created to eliminate. Many of Guatemala’s rural areas, especially along the Mexican border, are dominated by gangs descended from the Castro-supported guerrillas of the internal armed conflict (1960-1996). These gangs destroy businesses, invade private property and block police access. The unholy alliance of the CICIG, the captured high court, the State Department, and the ministers forced on President Jimmy Morales has protected the socialist gangs, which pretend to be human-rights organizations. Trump’s electoral victory presented an existential challenge to State Department officials and their socialist allies in Guatemala and the U.S. Congress. Guatemalans expected Trump to change Obama’s policy, but his administration has had more pressing issues. With little oversight, State Department holdovers have plowed ahead. Robinson undermined Trump by signaling the Obama policy would remain. He also attempted to consolidate his allies’ power so Trump would be stuck if and when he paid attention. President Jimmy Morales of Guatemala was slow to comprehend the difference between Obama and Trump. Robinson and his moles in the Morales administration kept the Guatemalan president away from Trump. At the end of 2017, Guatemala sided with the United States in the U.N. vote to condemn the U.S. embassy move to Jerusalem. Guatemala became the first country to follow suit and move its own embassy. Morales’s political opponents, also Trump opponents, reacted negatively. They feared the move portended them joining forces, but nothing happened until this August. Morales moved against the CICIG and confronted U.N. Secretary-General Antonio Guterres about his failure to act against CICIG criminality. The Trump administration transitioned from indifference to apparent support of Morales. At the U.N. General Assembly, photos emerged of Trump, Haley and Pompeo smiling with Morales. In October at the Conference on Prosperity and Security in Central America, for the first time Morales denounced the rogue high court. Morales’s new and apparently close relationships with Trump, Haley, Pompeo, and Republican senators have put him in a difficult position regarding the Honduran caravan. Stopping the caravan comes with legal complications and political fallout, but not doing so risks Trump’s wrath. The caravan aside, the flow of illegal migrants and drugs remains from and through Guatemala into Mexico and to the United States. Trump can reduce the flow by helping Morales with equipment, training, on-site advisors and political support—including reining in the State Department. Morales likewise must be willing to apply the law to criminal gangs and take on Robinson’s rogue court. That would liberate inhabitants and businesses in rural border areas, creating more opportunity and less reason to migrate. Grateful recipients would cooperate with security forces to identify people from outside their areas engaged in suspicious activity. Migrants, smugglers, and terrorists would lose their land route to Mexico from El Salvador, Honduras, and places south. This article was first published in The Dailly Caller.